Once your child becomes a teenager, water safety becomes even more challenging. Even if adolescents have completed a swim program and are confident in the water, many enjoy hanging out with friends at the pool or beach—away from your supervision. Therefore, while childhood drowning risk decreases after age 4, it actually goes up again during a child's teen years—even among strong swimmers. Adolescents (15-19 years old) have the 2nd highest fatal drowning rate out of any age group. Only toddlers (ages 12-36 months) have a higher risk. Why does the drowning risk rise for teens? Teens are more likely to overestimate their skills and underestimate dangerous situations. Although they often lack experience, adolescents tend to feel invincible. The part of the brain that controls complex decision-making and impulse control is still developing at this age, making teens more likely to take risks. In addition, teens typically feel like they are being judged by their peers and may try to keep up with them or impress them even if they don't have the swim skills and experience. Drinking and drowning dangers. The risks of substance use become a bigger factor during adolescence. About two-thirds of students have tried alcohol by 12th grade, for example. Research shows alcohol is a leading risk factor in drownings; drinking alcohol while swimming or boating is a major cause of 30-70% of recreational water deaths among U.S. adolescents. Teen drowning risk increases in lakes, rivers, and other natural water. While younger children in the US are more likely to drown in swimming pools, teens are more likely to drown in natural bodies of water like lakes, rivers, oceans, ponds and other natural water. According to statistics, the rate of fatal drownings in natural water for adolescents 15 to 17 years of age is more than 3 times higher than for children 5-9 years old. The American Academy of Pediatrics (AAP) recommends families use layers of protection against drowning. Make sure everyone learns how to swim. If your family hasn't been able to learn basic swim and water survival skills yet, it's not too late! Many organizations offer swim lessons specifically geared toward teens and adults. Your teen may even enjoy lessons enough to continue with lifeguard training, reinforcing their water safety skills (and, as a bonus, preparing themselves for a possible summer job)! Continue to supervise; it saves lives. Remember that knowing how to swim will not "drown proof" a child of any age. Even among older children and teens, most childhood drownings happen when there is no adult supervision. Make sure your teen knows to swim only where there are lifeguards on duty and to never swim alone. Urge them to use the buddy system, even when swimming with large groups of friends. Teach your teen to always enter the water for the first time feet first. It is important to know the water's depth beforehand. Also, going in feet first helps them know whether there are underwater hazards like large rocks that can't be seen from the surface. Make sure they look for―and follow―any "No Diving" instructions posted. Diving into unsafe water can lead to serious, and sometimes permanent, spinal injuries. stick with designated swimming areas with lifeguards. avoid beaches with large waves, a powerful undertow or rip currents. stay away from areas where there are boats and people fishing. Always wear life jackets when boating. 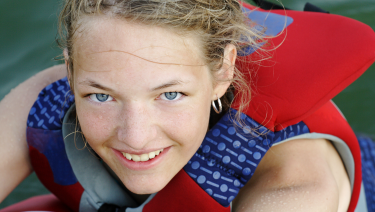 Adolescents should always wear US Coast Guard-approved life jackets whenever they are in or on boats, jet skis and other watercraft. Adults should wear theirs when boating, too, to be good role models and be ready to help in case of emergency. Make sure your teen knows never to rely on inflatable tubes and rafts as life preservers. Stay sober on the water. Talk to your teen about how alcohol and drugs make being in or on the water more dangerous. Alcohol use while boating increases drowning risks among passengers as well as boat operators. Explain that alcohol interferes with swimming skills, balance, coordination and judgment, and can increase the risk of hypothermia in the water. Adults should also avoid alcohol while supervising children or before swimming, boating, or water skiing. Be aware of cold-weather water hazards. Remind your teen not to walk or ride snowmobiles on thin or thawing ice. Everyone should know how to respond to a drowning emergency. Everyone―including parents, caregivers and older children and teens―should learn CPR and safe rescue techniques to respond when there is trouble in the water. They should also know how to get help. Encourage your child's high school to provide CPR training during health class. Hundreds of teens, including some who are good swimmers, drown each year in the US. But, these tragedies are preventable. Talk with your pediatrician during your teen's annual wellness exams about staying safe in and on the water.